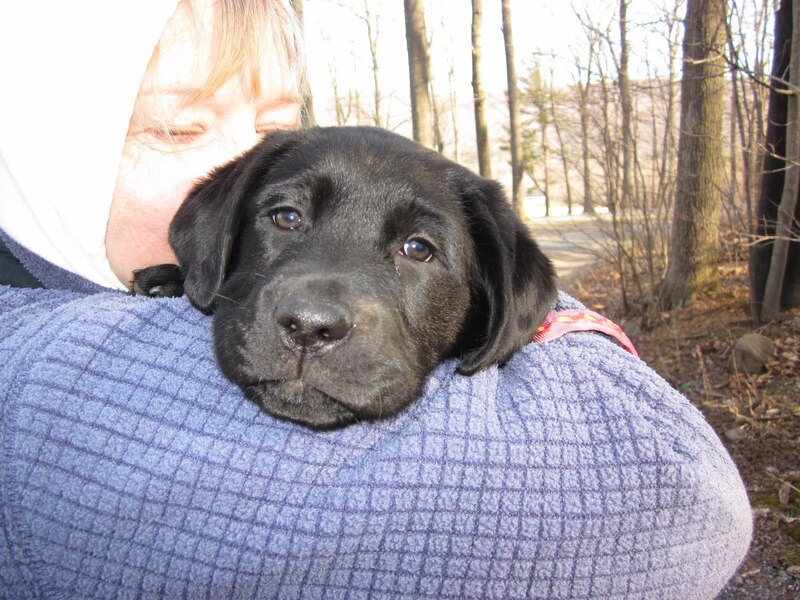 SSD Julia, Harriet, Clara, Chamberlain, Meade, Yahtzee, Rummy and Atari are in the middle of a week full of puppy hugging! Puppy hugging is one of our favorite activities, and not just because of the cute puppies. We enjoy it because we get to meet a lot of people from the community. We were very happy to have some potential puppy raisers and sitter visit the puppies, as well as an entire troop of Girl Scouts! Even though these puppies are only eight and nine weeks old, they are already bringing people together. And that is ultimately what they will do - bring people from the community together. When they join their puppy raisers and go out in public, these dogs will spark conversations between strangers. Whether it's in the grocery store, at a sporting event, or on a walk through the park, people often pause and ask questions about the dogs - which we think is wonderful! 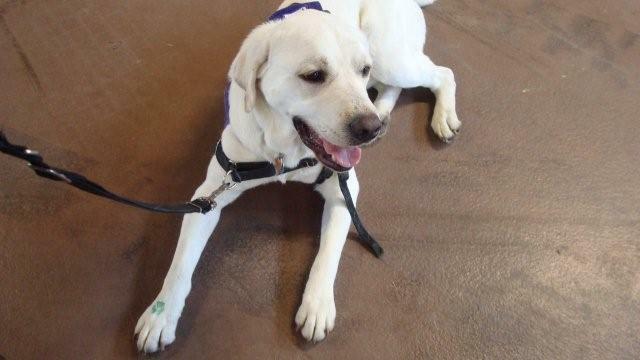 And once a service dog is placed with their partner, the dog will not only assist them in daily tasks, but will also act as a link to the community. Many people who have received service dogs from us have told us that their service dog has opened the door to conversations with people in the community - conversations that may not have happened before they received their service dog. 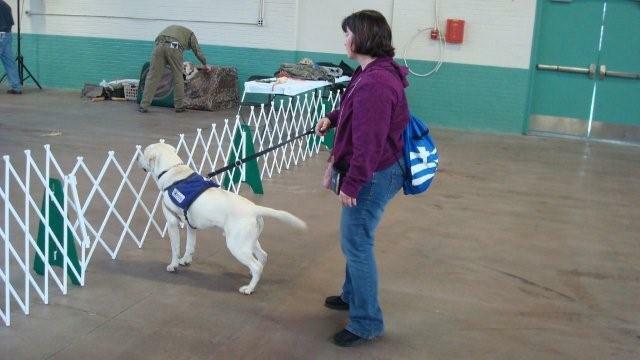 That is why we train service dogs. We may train them to literally open doors, but it is our goal that the dogs will open other doors to inclusion and participation in the community. We hope you enjoy our videos of the puppies as they begin their important journey to become service dogs. SSD Julia learns that if she looks at her puppy hugger, she'll get a click and a treat. SSD Meade trots over to his puppy hugger when he's called. He knows he'll get a treat! The puppies spent some time exploring the field at the kennel. Playtime and walks in the woods or parks is important for puppies because it stimulates their minds and increases their capacity to learn. In this video, SSD Chamberlain plays in the field. He seems to very focused on exploring, but watch what he does once he realizes he's on camera! SSD Atari trots through the field with confidence! It's funny how dogs quickly pick up on our routines. 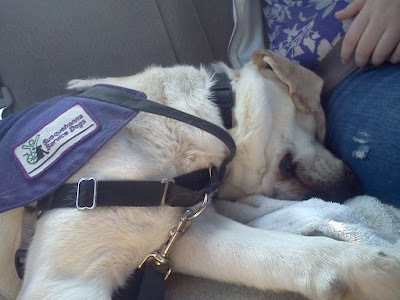 SSD Nubble certainly knows his puppy raiser's work-day routine. Every morning, they do a little bit of training before Donna gets ready for work. Nubble then curls up on his favorite spot on the couch and relaxes. As soon as he sees Donna in her uniform shirt, he hops off the couch and goes right into his crate. Donna hasn't had to cue him to go into his crate for at least three months! If you've been following Nubble, you know that stairs are a real challenge for him. One year ago, he would pull Donna up the stairs. Today, he will walk calmly beside Donna as they go up the stairs. How did this change happen? Lots of practice! They would practice stairs any chance they got. In fact, it got to the point where Nubble just assumed they would be going up any stairs they came across. Once Donna realized this, she eased up on practicing so that Nubble wouldn't start to get stressed every time he saw a set of stairs. The big breakthrough came in February. Nubble finally went down Donna's basement stairs! They have also been practicing going up those stairs. Last time, he walked up, stopped midway and turned around to go up backwards, then changed his mind and walked the proper way up the rest of the stairs! Now Donna can sometimes stop midway up the stairs and Nubble will continue going up the correct way. Great job, Nubble and Donna! Nubble has been going to puppy classes in our Northeast Puppy Raising Program and in Harrisburg to help him get used to being around other dogs. He has made wonderful progress! 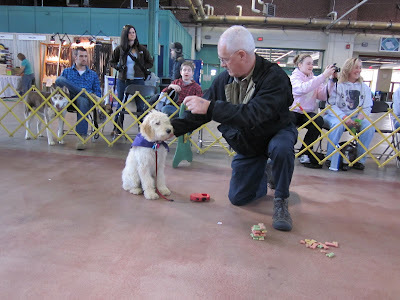 At the Harrisburg puppy class, he would bark at some of the dogs, particularly SSD Taz, but last week, both dogs made it through the entire class without barking! And when Nubble does bark at another dog, he now does a much better job re-focusing and ignoring the dog. 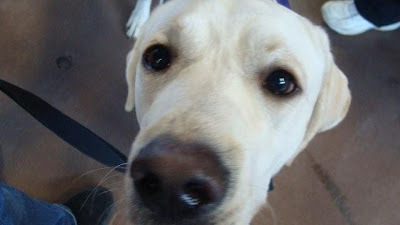 Although he still isn't too sure about puppies SSD Ben and SSD Cassie in the Northeast, he and Donna are working on it. Nubble certainly enjoys going to puppy classes! When Donna and Lindsey go to classes in the Northeast, they take the turnpike. Puppy class is located about 1/4 mile off the exit. Nubble relaxes in the car, but as soon as they go through the toll booth, he lets out a little excited whine. He knows he's going to puppy class, and he's happy! Last week on the way home from the Harrisburg class, Donna and Lindsey took the turnpike. When they got to the toll booth to get off the turnpike, Nubble looked around and let out an excited whine, but he seemed confused. As soon as he realized they weren't going to the Northeast puppy class, he laid down and went back to sleep. Nubble enjoys shopping, and regularly goes into stores with Donna. When they go into pet store, though, he has a tendency to pick out his own stuffed animals from the lower shelves. And while Donna puts the stuffed animal back, Nubble grabs another one! Our volunteer trainer in the Northeast suggested putting Nubble in a down-stay while Donna is returning the toy. So far, it has been working very well. Donna has also become more aware of Nubble's environment, and they practice "leave it." This past weekend, they went to the Berkshire Mall. It was packed because there was a car show inside. Despite the crowd, Nubble did very well with greetings. He has certainly come a long way! 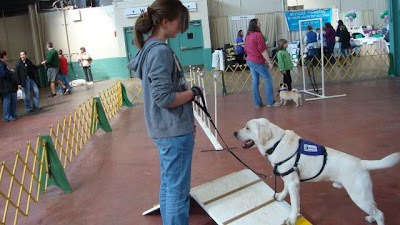 An obstacle course, Doggy Limbo, tickets for prizes - sounds more like PawsAbilities than puppy class! 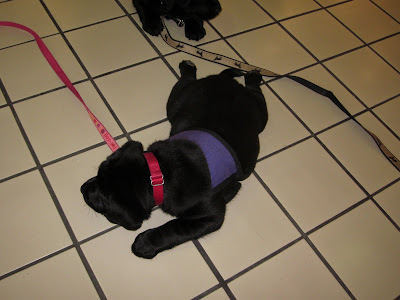 We decided to do something a little different at last week's puppy class. Instead of having everyone sit around the room and practice different skills, we created an obstacle course through the hallways. In the obstacle course, the dogs had to practice going under a chair, down with distractions, self control at the food bowl, leave it, go on through a tunnel, walking over strange surfaces, and loose leash walking. The dogs and their puppy raisers had a blast! We also played Doggy Limbo - a great way for the dogs to practice maneuvering themselves through challenging spaces. SSD Jagger waits patiently for his puppy raiser to ask him to go through to the other side. SSD Opal scoots under the limbo stick. To help her keep her body low, her puppy raiser drags a treat along the floor. Eventually, it came down to SSD Falcon, a black poodle, and SSD Peach Pie, a black lab. SSD Falcon demonstrates the "poodle scooch" method of moving under the limbo stick. 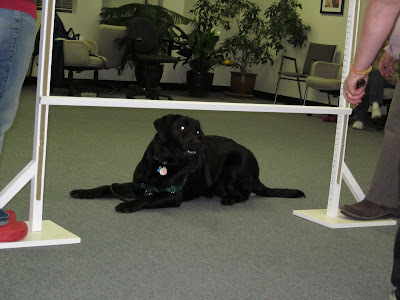 Even though he's a tall dog, he was able to keep himself right next to the floor as he scooting under the limbo stick. Eventually, though, the limbo stick moved down too low. SSD Peach Pie stays in a nice down before she did the "lab crawl" under the limbo stick to win the game! We also introduced a new method of training, called TAGteaching. We learned this method of teaching at the Clicker Expo. What is TAGteaching? It's clicker training for people! Everyone puts their name on a bunch of raffle tickets, and then when they see someone doing something good with their dogs (such as loose leash walking, recognizing when their dog needs a break, etc. ), they give that person a raffle ticket. Recipients also put their names on the tickets. Those tickets can then be used for the raffles at our puppy lectures, and every time a ticket is drawn, the people who gave and received that ticket win a prize! We think this will be a fun new way to train our dogs and reward our puppy raisers for doing an awesome job! The Game puppies went to the mall, but not to shop. They were there for their first public outing! Rummy, Atari and Yahtzee are seven weeks old and they got their shots on Tuesday, which means that they can now go out in public. They visited the Colonial Park Mall this morning and were quite a hit! As soon as they walked into the mall, people came over to see them. 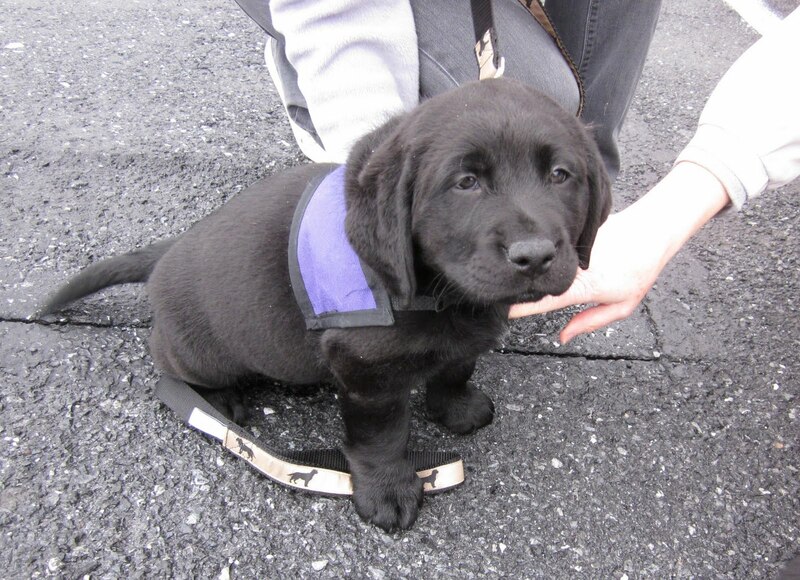 Normally, when you see a dog wearing a service dog harness, you should not go up and pet them. You should always ask first, and if the dog's owner says no, you should respect their wishes. The dog is working and should not be distracted. For the Game puppies' first outing, however, we encouraged people to pet them if they asked. When the puppies are this young, they need to learn that people are friendly and not something to be afraid of. 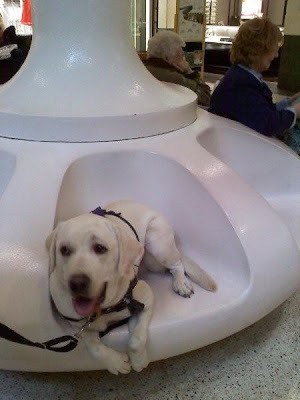 Rummy, Atari and Yahtzee had a great time running around in the mall! At first, all of the puppies were running and prancing all over the place, exploring their new environment. Look at Rummy go! Did you notice the leash? Watch Rummy run again, and pay careful attention to the leash. Even though Rummy is moving as fast as she can, her handler is careful to keep the leash loose so Rummy doesn't learn to pull. Loose leash walking is one of the most important skills a service dog can have, and we start training it right from the start because it's also one of the most difficult skills a dog learns. Already the puppies are learning that if they come when called, they'll get some tasty treats! Look at how eagerly they follow one of their handlers! Atari picked up on this concept right away. She scampered to her handler when called, even though she's looking at something interesting. 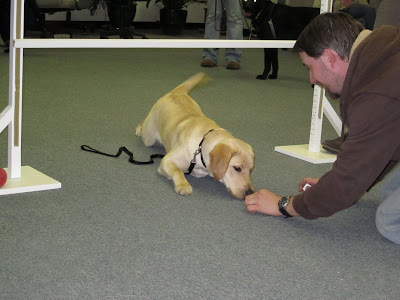 Listen to how her handler gives her lots of verbal praise in addition to treats. This is a great way to let Atari know that she did good job! After getting a few treats, Yahtzee started giving his handler nice attention. He focused on her instead of all the interesting things in his environment. He's still a little puppy, and his focus didn't last a long time, but he's already off to a great start! Soon, though, Rummy and Yahtzee started to slow down, and by the end of the outing, they were stretched out on the floor. Atari, on the other hand, still had lots of energy, even after 30-45 minutes of romping around the mall! These puppies will be going to the kennel on March 28, along with the Civil War puppies. They'll spend a week at the kennel, and then they'll go to their puppy raisers. The Civil War puppies have had their shots, which means they're ready to go on public outings. Guess where we took them for their first official time in public? That's right - the National Civil War Museum! Meade, Chamberlain, Clara, Julia and Harriet were there for the opening reception of the Civil War Museum's new exhibit "Among Soldiers: Animals in the Ranks of the Civil War." The puppies had a great time meeting new people and exploring a new place. The Civil War puppies are seven weeks old. At the end of the month, they'll come to the kennel for temperament testing and then they'll go to their puppy raisers! If you're interested in raising a puppy, visit our website to apply. Nubble went to PawsAbilities for his second year in a row! He loved it! 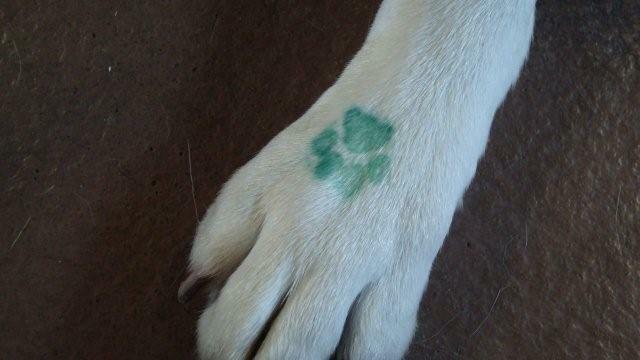 He got his paw stamped so he could come and go as he pleased at PawsAbilities. Nubble and puppy raiser Lindsey tried out the Fun Agility course. Nubble watched the hunting retriever dogs demonstrate retrieving. At first, he was very focused on the dogs playing fetch, and he pulled on his leash. All he wanted was to play with them! Donna kept working with him, however, and soon he was once again focused on her, even though the hunting retriever were still playing fetch in the ring. 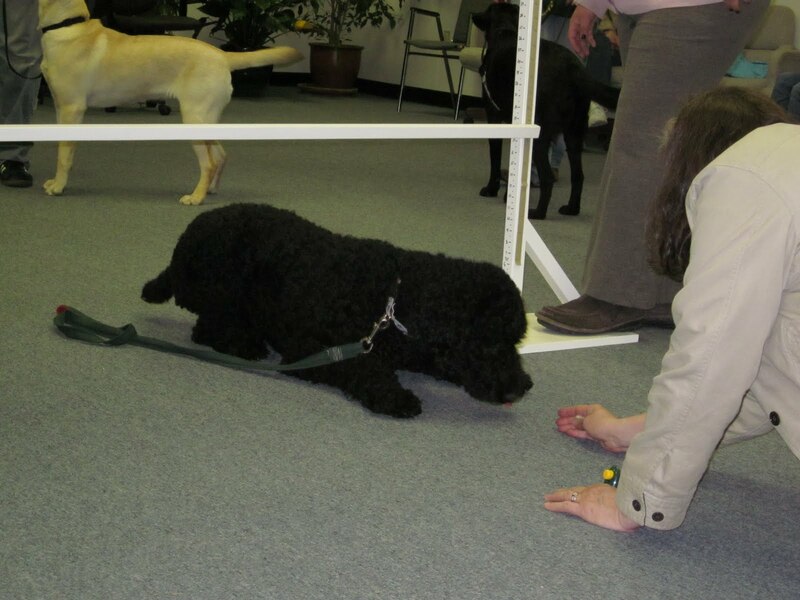 Later, Nubble was invited to try hunting retrieving, so he got to go in the ring and play. What a happy dog he was! After a fun day at PawsAbilities, Nubble was all tuckered out! It was a good day! What a Weekend at PawsAbilities! What a weekend! Did you have as much fun at PawsAbilities as we did? 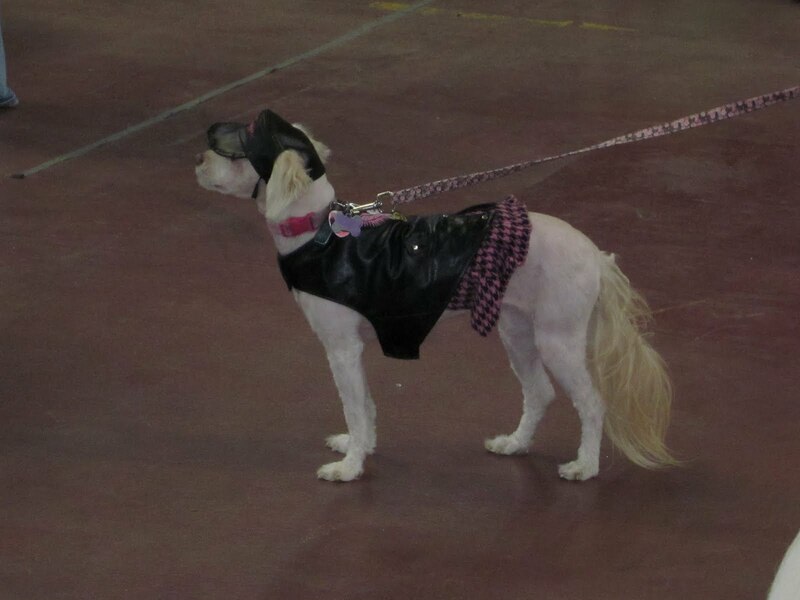 On Saturday and Sunday, the Pennsylvania Farm Show Complex was full of dogs playing, barking and greeting each other. Dogs had fun playing our new Dog Olympic Game, the Temptation Tower! Handlers tried to build the tallest tower of dog biscuits while their dog watched. The Ultimate Air Dogs were a favorite among people and canines. Watch one dog leap right off the dock into the pool to retrieve a favorite toy! Other dogs weren't quite sure they wanted to make the big leap, even if their favorite toy was in the water. You could almost see one dog's thoughts as he runs around the dock trying to decide if he's going to make the jump. What did he finally decide? Watch the video to find out! Dogs had lots of fun leaping over hay bales, sitting in hula hoops and running through tunnels in the new Obstacle Gambler's Choice game. Big thank you to Dog Scout Troop 161 for running it! You should have seen the costumes on some of these dogs for our Costume Contest! They were great! What was your favorite part of PawsAbilities? Let us know in the comments. And don't forget to check out our Facebook page! People have been sharing their favorite photos of their dogs at PawsAbilities. We love them! If you have a favorite photo of your dog at PawsAbilities, post it on our Facebook page so everyone can see it! Thank you to all the people and dogs who attended! We hope you had a great time! Thank you to all of our wonderful volunteers for helping us set up, run the big event, and tear down afterwards. We couldn't do it without you. And of course, a special thank you to Vikki, our events coordinator, and the PawsAbilities committee for making PawsAbilities a reality. We certainly appreciate all of your hard work! It's almost time for PawsAbilities! It's almost time for PawsAbilities! Our cars and trucks are packed and we're heading to the Farm Show for an entire day of set-up. And tomorrow the big weekend begins! 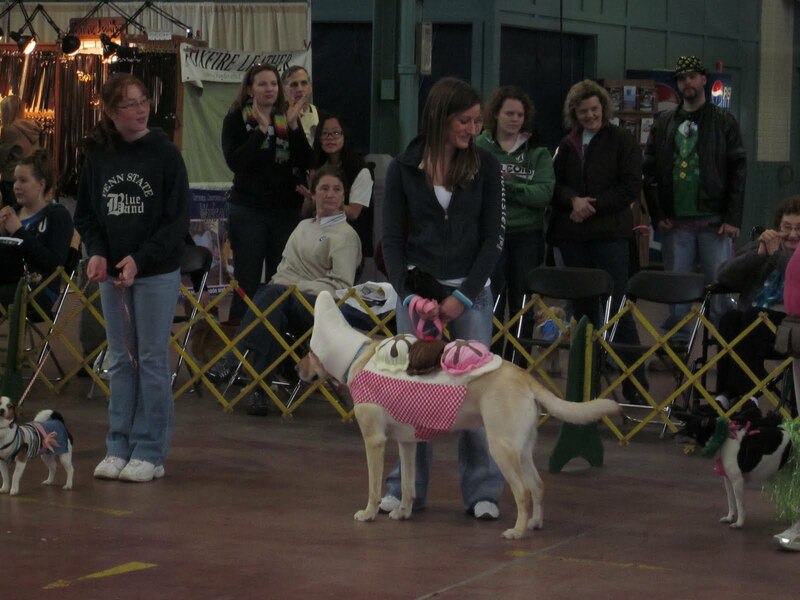 Come to the Farm Show Complex in Harrisburg from 8 a.m. to 4 p.m. on Saturday and Sunday for two whole days of canine fun! Bring the entire family, and don't forget your dogs! Countdown to PawsAbilities: 3 Days! Three more days until PawsAbilities! Do you know what your and your dog are going to do? On Saturday and Sunday, we have a solid lineup of presentations and demonstrations on the PawsAbilities stage. You'll be able to learn about doga and see a demonstration, find out how K-9 Loki figures out where a fire started, see how a blood hound searches for a missing person, and learn about dog safety, clicker training, and our puppy raising program. Check out the stage schedule online for times. This year, you don't want to miss the Kody Kup Walk! Three Dogs Barking generously donated the grand prize - a tower of Kody Kups, toys and treats! Make sure you sign up at the Dog Olympics registration booth so you have a chance to win this prize. 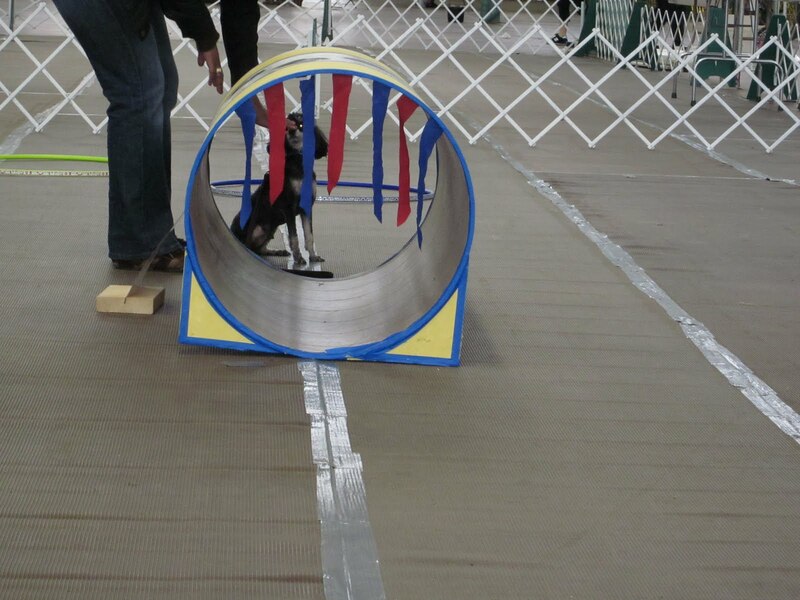 And don't forget about the fun agility course, where you and your dog can find out if agility is a new, fun activity for you. There will also be the frisbee-catching Appalachian Air Canines, freestyle dancing with dogs, flyball, and of course, the Ultimate Air Dogs! Visit www.pawsabilities.net for more activities. Tickets to PawsAbilities are available at the door, $10 general admission, $5 children ages 4-12. Please be aware that the Farm Show Complex charges $8 for parking. What's New at PawsAbilities 2011? We want this to be the best PawsAbilities ever, and we've added some new, fun things for you and your dog to do! 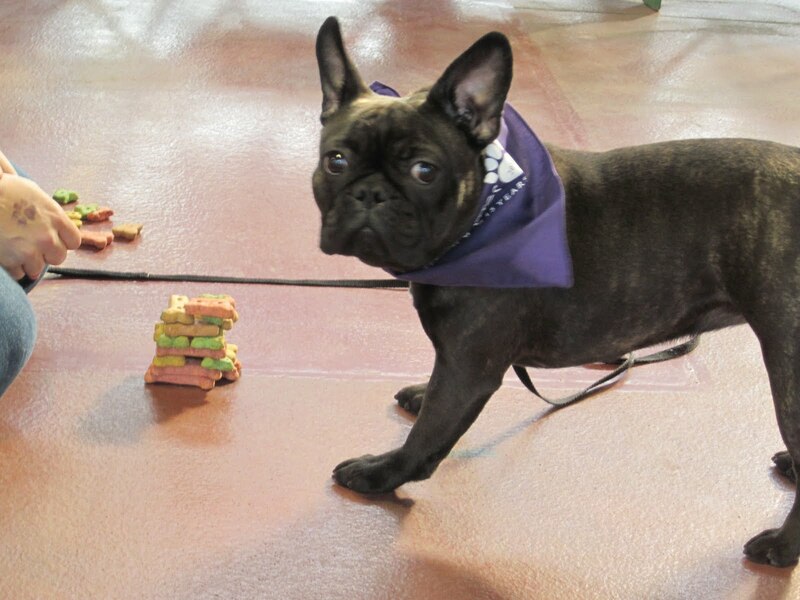 At the Dog Olympic Games, play the new game, Temptation Tower, at 9 a.m. and 1 p.m. each day! Test yourself and your dog in the Obstacle Gambler's Choice event. In this obstacle course run by Dog Scout Troop 161, each obstacle has a different point value, and you must choose which obstacles you and your dog want to complete. But choose wisely because you only have a certain amount of time to rack up as many points as possible! Help your dog reach a state of zen with doga (yoga for dogs). 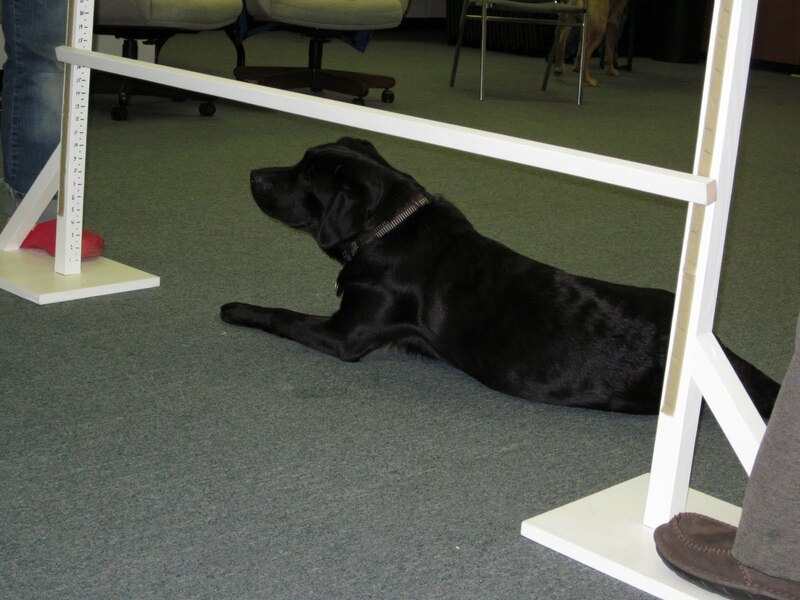 After watching a demonstration on the PawsAbilities stage, you and your dog can try doga. This is a great way for you and your dog to relax! You don't want to miss the demonstration of Newfoundland dog carting! You and your dog will also have a chance to see if cart pulling is for you! 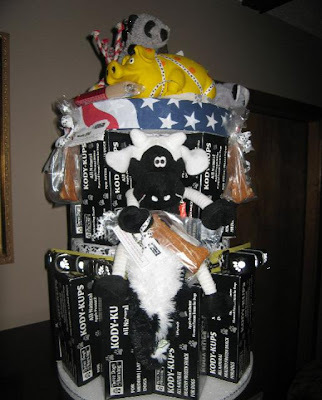 The cake walk is an annual favorite in the Dog Olympic Games, but this year we've put a new twist on it. In the Kody Kup Walk, you and your dog could win the grand prize - a tower of toys and Kody Kups, those delicious frozen apple peanut butter treats. Once again, the Ultimate Air Dogs will be leaping into PawsAbilities! Come watch these amazing dogs launch themselves off a dock into a pool of water. Enter your dog in the Cutest Dog Contest. Hosted by Denny Logan of WINK 104 at noon on Saturday and by Jen Shade of 105.7 the X at 12:30 p.m. on Sunday, this contest is always a crowd-pleaser. The contest is free, but there will be a limited number of entries. Be sure to come early to register your cute dog! March in the Abrams & Weakley Parade! You and your dog will have the opportunity to win prizes for marching in the parade. We will be awarding prizes for the dog with the biggest ears, longest fur, shortest tail, most spots and more! Vendors, vendors and more vendors! With over 70 vendors, you'll find everything you want and need for your dog, plus some things for yourself! 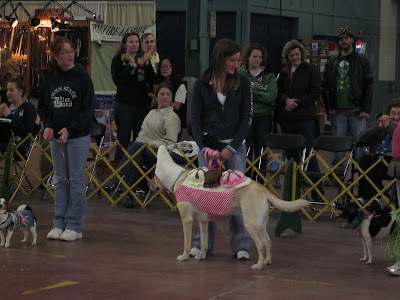 Check out www.pawsabilities.net/vendors for a list of the 2011 vendors. Check out www.pawsabilities.net for more fun things to do at PawsAbilities! And don't forget to buy your tickets so you don't miss this weekend for the dogs!